For those who don't have a lot of time, I do offer a half hour massage. I will work on your problem areas, but please know results are usually better with a longer session. This massage is ideal for those who suffer from headaches, tension, or who sleep wrong. This half hour massage only focuses on the head, neck and shoulders - very common places to hold tension. Muscle tension, aches and pains can often hold us back from doing the things we want or need to do. 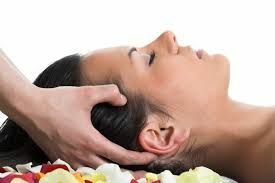 A head, neck and shoulder massage is very relaxing and targets the places you hold the most build up of stress – I will find your desired level of pressure, whether you need a strong massage to relieve built up tension, or a gentle and tranquil experience if you just need a break from busy life. A head, neck and shoulder massage is a wonderful way to ease shoulder and neck tension or a "kink" in the neck from strain or sleeping wrong, all while gaining a peaceful retreat from the outside world. A feeling of immense relaxation is the most likely benefit along with feelings of having had a “mini break”. If you suffer from tension or anxiety you will most likely find some relief from these. Additional Swedish massage techniques include circular pressure applied by the hands and palms, firm kneading, bending and stretching. Before and during your Swedish massage session, communication is encouraged with your massage therapist so that your massage is customized to your specific needs. The benefits of this type of bodywork are wide-ranging and include relief from aches and pains, decreased stress levels in the body, enhanced mental clarity, improved appearance, and greater flexibility. If you need some extra time in a certain area and 1 hour is just not enough, this is a nice option. 90 minute massage allows for a more focused session on each area. Chair massage is a popular way of relieving stress and tension. You receive your massage in a specialized ergonomic chair. In addition to the usual health benefits of massage, another benefit of chair massage is that it is done over the clothing. With seated massage, you can avoid the discomfort and awkwardness that you may feel in disrobing for a traditional massage. Also, chair massage sessions are usually shorter than traditional massage, making it convenient enough to fit into your busy schedule. Whether you're on a romantic getaway or simply treating yourselves to a spa session, a couples massage is a great way to relax and rejuvenate both you and your loved one. Despite the suggestive name, couples massages aren't just for couples -- friends and family members can also enjoy this invigorating experience together. Couples massage can not be booked online. Currently, it is only available on Saturdays. Please email me or text 352.225.1275 to set up a couples massage, it requires coordinating schedules and can't be booked online. Couples massages are often provided at hotels, spas or massage practices. A larger room equipped with two massage beds provides the setting for the massage session. In establishments where couples massages are geared towards romantic partners, dim lighting and candles may accentuate the atmosphere. During a couples massage, one massage therapist is assigned to each individual so that massages can be provided simultaneously. You and your partner may engage in a massage therapy session together in order to help each other feel more comfortable experiencing a massage; this is especially true if your partner is attending his first massage therapy session and will feel more at ease with you there. Couples massage can also be used as a way for you and a romantic partner, loved one or friend, to spend quality time together and become closer in your relationship. For a couples session, massage therapy is usually intended for relaxation purposes rather than the healing of an injury. Swedish massage, the most common form of massage according to the American Massage Therapy Association, is often used in couples massage for its relaxing effects. There are a number of physical effects associated with massage therapy from which you and your loved one can benefit during your session. Research supports the connection between massage therapy and short recovery periods for a variety of medical conditions. Among the conditions that may be eased due to massage therapy are musculo-skeletal disorders, fibromyalgia, insomnia, asthma, arthritis and depression. Massage therapy has also been shown to reduce stress and strengthen the immune system.